Very delicious oven baked Greek Bell Peppers with a simple rice filling. Indian Yellow Curry Rice with Raisins	No ratings yet. A very simple Indian Rice Dish. 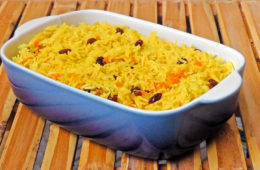 Yellow Curry Basmati with sweet Raisins. Chinese Eggplant Rice	No ratings yet. 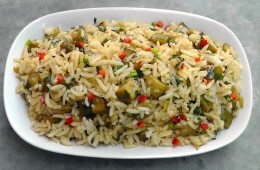 Just a simple Chinese Rice Recipe with fried Eggplant. The five spice powder and the sauces give the rice a nice and aromatic taste. Thai fried Pineapple Rice	No ratings yet. 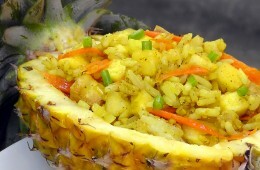 A very fast and easy fried Rice Recipe with Pineapple. Khao Pad Sapparot is a very simple but delicious thai dish. The Rice is fried with yellow curry powder and then pineapple and fried tofu are added. It is best to use cold Rice from the day before or at least put it in the fridge for about 2 hours. With the Rice already ready, this dish is made in no time. Indonesian Nasi Goreng	No ratings yet. Nasing Goreng means nothing more than "fried Rice " and is a Indonesian national dish. 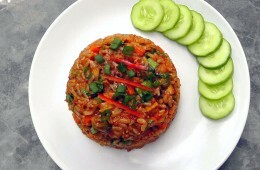 The already cooked Rice is stir-fried with vegetables in a sweet and hot chili Paste.